you ever had a piece of jewelry or gem just reach out and grab you? That’s what happened to when I first came across this String of Golden Pearls. The shimmering warmth and beauty of their golden luster is what inspired me to draft a book on Pearls—“Secrets of the Pearl: Gem of Love and Beauty”. The Golden Pearl Necklace is strung with 33 naturally colored South Sea Pearls. Each Golden Pearl took years to develop, deep in the warm waters of the tropical sea. One by one these exquisite pearls were selected out of tens of thousands and gently graduate in size, from 11 mm to 12.5mm. 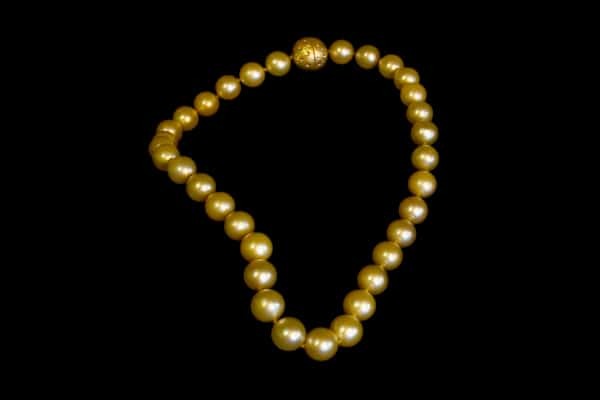 You may not be aware of it, but it’s extremely rare to find a strand of golden pearls with such a rich hue, pearls that are also so closely matched in color, shape and luster. With lustrous hues of gold, like sun light bathing the soft skin of calm water, Golden Pearls are becoming one of the most sough after gems in the glamorous world of fashion and fine art jewelry. A golden pearl necklace and earring set like this would add a touch of elegance to any ones personal jewelry collection. It’s something that even the most selective connoisseur could appreciate. Even though it’s not easily seen in the photo, the 22 karat gold clasp of this pearl necklace was crafted to resemble the moon. In symbolic jewelry and traditional lore pearls are closely associated with the moon. Actually, the golden harvest moon is considered an auspicious omen and after thousands of years is still celebrated. It’s the full moon that the Chinese celebrate during their Autumn Festival. When moon cakes are shared among loved ones and friends: moon cakes that represent the sweet gifts of natures rich bounty. If you think about it, golden pearls naturally represent the blending of fire and water. In eastern mythology, the dragon is often pictured holding a Flaming Pearl. Astrologically this great ball of fiery light, is none other then the moon. The Flaming Pearl, the unfolding flower of light, is so precious that it became a symbol of Buddha’s heart. The Golden Pearl of Perfection, is the wish granting gem that fulfills all of our hearts deepest desires. For the Buddhist, the pearl also represents pure intentions, and the spiritual quest of enlightenment. Golden Pearls also represent the fulfilling relationships: the ultimate alchemy of coming together with the one that you truly love. This is because the coupling of the masculine, fiery light, with the feminine, watery depths, is clearly evident in the illustrious pearl. It’s not common knowledge but pearls are the original gem of matrimony. A long and happy marriage is the Pearl, which is nourished on a soft fleshy bed, and protected between the two halves of an oysters shell. You might be surprised that the marriage between the god of love Eros/Cupid, and the goddess of the soul, Psyche, is represented by a strand of Pearls? The two ends of this shimmering strand, were held in the hands of ‘Hymen’, the god of marriage, song and verse. This is why it is believed that Pearls strengthen the bond of marriage and promote marital bliss. Pearls are like flowers, they come in nearly all the colors you can imagine. The golden hues of South Sea Pearl are produced by the gold lipped, Pinctada Maxima oyster. This necklace of golden pearls is part set that includes a matching pair of golden pearl earring studs.